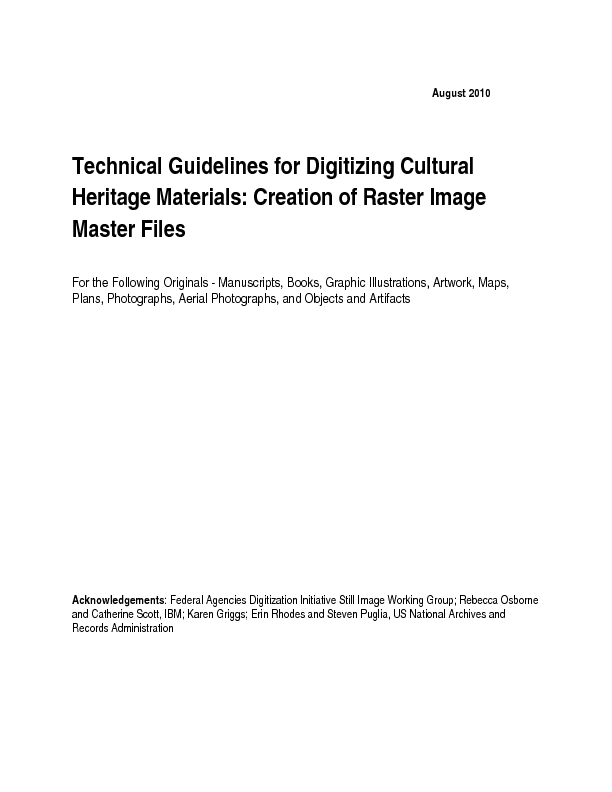 The Federal Agencies Digitization Guidelines Initiative (FADGI) was formed to create standards for digital heritage organizations run by the United States federal government. This document describes best practices for creating digital images, including best practices for setting up and calibrating a workstation, capturing the digital image, creating metadata for the image, and preserving the image over its lifespan. This document is the 2010 version of the guidelines, which is the most current as of 2015. Please check http://www.digitizationguidelines.gov/guidelines/digitize-technical.html for updates or revisions. This is in the public domain. Courtesy of the Federal Agencies Digitization Guidelines Initiative.